Regular moderate wine consumption has been associated with several health benefits. However the risk increases with each drink above moderation ! Drinking more than the recommended guidelines will not provide more benefits, only more harm! This widely accepted association is represented in the J-curve (J-shaped association between mortality risk and alcohol consumption). Throughout the developed world, cardiovascular disease is the leading cause of death and accounts for up to 50% of all deaths. Consistently, scientific studies are showing that consuming moderate amounts of alcohol reduces mortality from coronary heart disease as well as from other causes by 25-30% in middle-aged individuals, mainly in men aged over 40 years and in post menopausal women. Moderate wine drinkers have a lower mortality rate than those who abstain or drink heavily. This widely accepted association is known as the J-curve. The relative risk of dying is lowest among light to moderate drinkers and greater among abstainers. However, the risk increases with each drink above moderation. Thus, while one or two glasses can be considered “good for your health”, drinking more than the guidelines will not provide more benefits, only more harm! Approximately half of the cardio-protective effects of wine are believed to be due to alcohol itself since it changes the balance of lipids in the blood favourably. Vascular disease occurs when bad cholesterol (LDL) is deposited in artery walls and builds up, eventually rupturing, causing a clot to form which blocks off the artery and the tissue supplied with blood by that artery dies. Alcohol stimulates the production of the “good” high density lipoprotein cholesterol (HDL) which removes the “bad” low density lipoprotein cholesterol (LDL) from arteries and veins where it can form plaques. It also reduces the “stickiness” or the clotting together of red blood cells which could form a clot and block the blood flow in an artery (thrombosis) resulting in a heart attack or stroke. Furthermore, alcohol has an overall anti-inflammatory effect that affects the blood vessels positively and thus, delays the development of atherosclerosis. Wine, in addition, contains phenolic substances which act as antioxidants and inhibit bad cholesterol from being incorporated in the artery wall. These antioxidants also reduce the damage caused by the body's free radicals (toxic waste products) which contribute to causing degenerative diseases in the body such as cancer, Alzheimer's disease, Parkinson's disease and ageing. It should be noted that the antioxidant activity in unfermented grape juice is lower than in the finished wine - antioxidant activity increases during fermentation and maturation. Antioxidant levels will depend on the processing, filtering as well as on the variety, vintage, altitude and soil. Resveratrol, along with quercetin and epicatechin, is one of the main antioxidants found in wine. These phenolic bioflavonoid compounds give wine its characteristic colour and flavour and are produced by plants in response to fungal infection, ultraviolet light, and various chemical and physical stressors, especially during ripening. Researchers have shown that these antioxidants in wine are five times more potent than the benchmark antioxidant, vitamin E.
These findings support the overwhelming and growing body of scientific research indicating that moderate consumption of alcoholic beverages is associated with lower levels of coronary heart disease as well as with better health and greater longevity. Evidence from large population studies suggests that light to moderate drinkers of alcoholic beverages have also a lower diabetic risk than abstainers or heavy drinkers. Results of a meta-analysis examining the relationship between moderate alcohol consumption and type 2 diabetes indicate a protective effect for developing diabetes when wine is enjoyed moderately. A 30% reduced risk of diabetes is seen in men as well as in women. But not only the risk of developing type 2 diabetes is decreased with moderate consumption of alcoholic beverages; it may also reduce potential cardiac complications relating to diabetes. This is especially important considering that coronary heart disease is the leading cause of death among people with type 2 diabetes, who also have a 4-fold increased risk of having a heart attack or stroke. Research indicates that this risk decreases considerably when they consume wine moderately with meals. Considering the world-wide epidemic of type 2 diabetes which is expected to rise even further and is associated with major health care costs, preventing diabetes is a major public health issue. It appears that drinking in moderation could, however, help reduce type 2 diabetes and thereby contribute significantly to public health. In light of such findings, the benefits of moderate wine consumption also need to be adequately recognised. However, the scientific findings regarding the benefits of moderate consumption, whether physical, mental or social should not be an incentive to exceed the guidelines for moderate drinking of alcoholic beverages. Drinking wine should be for pleasure and enjoyment rather than for any health benefit and drinking more than the recommended amounts will not provide more benefits, only more harm! 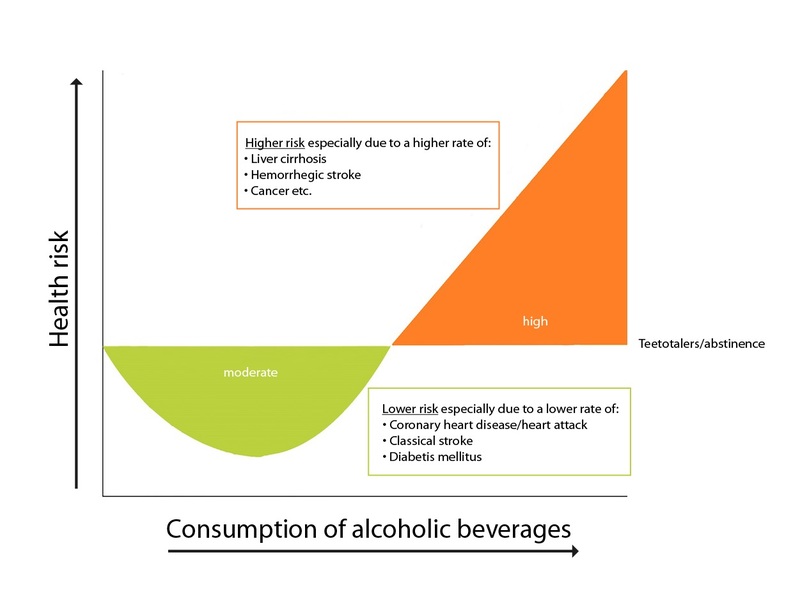 If consumed in excess, alcoholic beverages increase the exposure to a wide range of risk factors whereby the risk rises with the amount of alcohol consumed. Thus, it is crucial to prevent abusive consumption. Alcohol misuse is associated with a range of long-term chronic diseases that reduce the quality of life. These include hypertension, cardiovascular problems, cirrhosis of the liver, alcohol dependence, various forms of cancer, alcohol-related brain damage and a range of other problems. However, not only the amount of alcohol but also the drinking patterns are important. Findings from a meta-analysis support results from other studies that binge drinking is detrimental to heart health. The authors concluded that it is best for drinkers to avoid binge drinking -- not only because of the possible heart effects, but also because of more immediate risks, like accidents and violence.